Six Accused of Plot to Attack Fort Dix Six foreign-born Muslims have been arrested for plotting an attack on the Fort Dix Army base in New Jersey. Investigators say the men planned to "kill as many soldiers as possible." An employee of a video-transfer business alerted authorities after the men wanted a suspicious tape converted to DVD. FBI agent J.P. Weiss addresses the media outside Camden Federal Courthouse. According to reports, six men were arrested on charges of planning to attack the Fort Dix military base with automatic weapons. Six foreign-born Muslims have been arrested for plotting an attack on the Fort Dix Army base in New Jersey. Investigators say the men planned to "kill as many soldiers as possible." 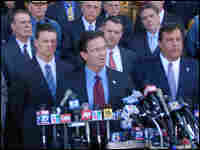 The six accused men went before a judge in Camden, N.J., on Tuesday afternoon. The defendants were all born in other countries — one is a U.S. citizen; two are legal residents, and three are in the United States illegally. Federal prosecutors say the investigators have video and audio recordings of the men talking about waging jihad and killing American servicemembers. 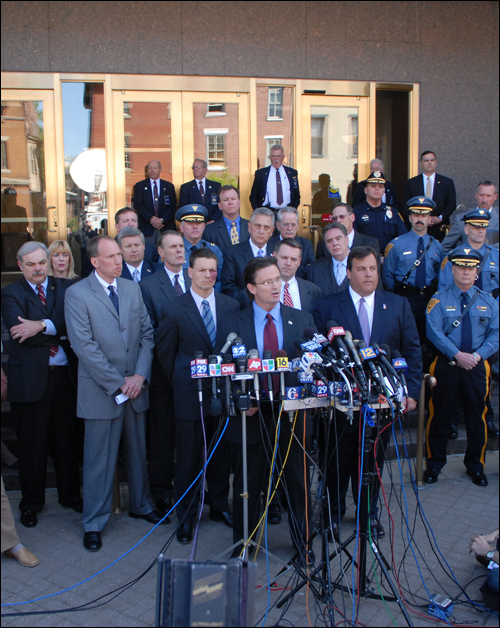 U.S. Attorney Christopher Christie spoke on the courthouse steps after the appearance by the defendants. "The philosophy that supports and encourages jihad around the world against Americans came to live here in New Jersey and threatened the lives of our citizens through these defendants," Christie said. "Fortunately, law enforcement in New Jersey was here to stop them." As NPR's Dina Temple-Raston tells Michele Norris, the investigation was sparked by a call from an employee of a video-transfer business, where the men had taken a videotape to be converted onto a DVD. On the video, the men were shown firing weapons and shouting "God is great" in Arabic, and calling for a jihad, or holy war, against the United States. The employee then contacted the FBI. Below is the criminal complaint unsealed Tuesday in U.S. District Court in New Jersey in connection with the alleged Fort Dix terrorism plot. Attachment A to the complaint is virtually the same for all defendants, according to the Department of Justice. Authorities have arrested six men from the former Yugoslavia and the Middle East who were allegedly recorded planning an attack on the Fort Dix, N.J., Army base aimed at killing U.S. soldiers, federal prosecutors said Tuesday. The six, who also spoke of attacking U.S. warships, were arrested trying to buy automatic weapons from undercover FBI agents, according to the U.S. Attorney's Office in New Jersey. "This was a serious plot put together by people who were intent on harming Americans," U.S. Attorney Christopher Christie said. Four of the men were born in the former Yugoslavia and two others were from Jordan and Turkey. Five of the accused lived in Cherry Hill, 10 miles east of Philadelphia and 20 miles from Fort Dix, federal officials said. Last August, at least two of the suspects were secretly recorded by a government informant discussing details of a plot, according to the criminal complaint. "If you want to do anything here, there is Fort Dix and I don't want to exaggerate, and I assure you that you can hit an American base very easily," suspect Mohamad Ibrahim Shnewer said, according to the complaint. Another suspect, Serdar Tatar is quoted in the complaint as saying he doesn't care if he's arrested "... Or I die, it doesn't matter. I am doing it for Allah." Still another suspect, Eljvir Duka, was recorded by a second informant as saying, "In the end, when it comes to defending your religion, when someone is trying attacks your religion, your way of life, then you go jihad." According to the documents, one suspect spoke of using rocket-propelled grenades to kill at least 100 soldiers at a time. Court documents said the suspects came to the attention of the FBI as early as January 2006 when a shopkeeper alerted authorities to a video he had been asked to copy onto a DVD. The video showed 10 young men "shooting weapons at a firing range ... while calling for jihad and shouting in Arabic 'Allah Akbar' (God is great)," the complaint said. Six of the men in the video were the same arrested later in the Fort Dix plot. Justice Department spokesman Dean Boyd said the men had viewed Islamic training and weapons videos on the Internet. "What concerns us is, obviously, they began conducting surveillance and weapons training in the woods and were discussing killing large numbers of soldiers," he said. White House spokesman Tony Snow, however, was quick to stress that there was "no direct evidence" that the men arrested had connections to al-Qaida. "At this point, there is no evidence they received direction from international terror organizations," Snow said. The six had trained in the Pennsylvania's Pocono Mountains and in rural New Jersey. They surveyed other military installations, including a U.S. Coast Guard facility in Philadelphia, according to the documents. The men were expected to appear in U.S. District Court in Camden, N.J., Tuesday afternoon to face charges of conspiracy to kill U.S. servicemen. Fort Dix is a training base for U.S. soldiers, particularly reservists. In 1999, it housed some 4,000 ethnic Albanian refugees during NATO's bombing campaign against Yugoslavia. The base typically has about 15,000 people, including 3,000 soldiers. Written by Scott Neuman with reporting from Dina Temple-Raston and Associated Press.